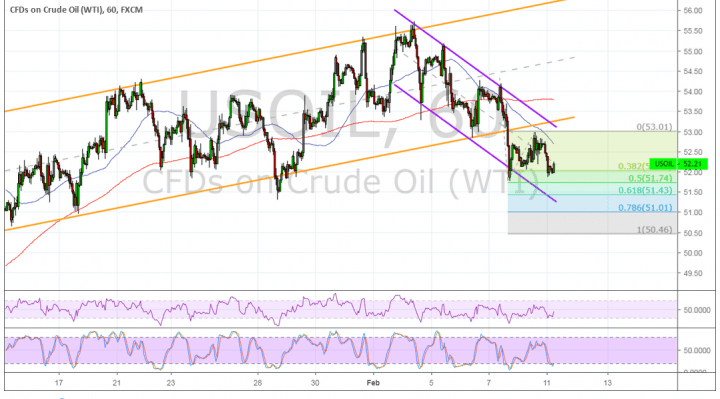 Crude oil is trending lower on its 1-hour chart as it recently broke below a longer-term rising channel and is now forming a short-term descending channel. Price seems ready to resume its slide without hitting resistance, though. The commodity is testing the swing low at the 38.2% Fibonacci extension level but might still sustain the drop to the 50% and 61.8% levels closer to the channel bottom. Sustained selling momentum could spur a drop to the 78.6% level at $51 per barrel or the full extension near $50.50 per barrel. The 100 SMA is below the longer-term 200 SMA to confirm that the path of least resistance is to the downside. This indicates that the selloff is more likely to gain traction than to reverse. The gap between the moving averages is widening to reflect stronger selling pressure and the 100 SMA lines up with the channel top to add to its strength as a ceiling. RSI is pointing higher, though, so there may still be some bullish momentum left. In that case, another test of the broken long-term channel bottom may be in the works. Stochastic is heading lower to signal that sellers have the upper hand, but the oscillator is nearing the oversold region to reflect exhaustion. Risk aversion has been in play in the financial markets over the most part of the previous week as geopolitical risks persist. For one, there hasn’t been much progress in Brexit and there are resurfacing concerns on trade tensions. High-level talks are set to take place this week and the lack of any accord could spur speculations of another round of tariffs between the two nations. This could once again cloud business outlook and weigh on commodity demand and prices. Apart from that, inventory data from the API and EIA might show another build, keeping oversupply concerns in play.